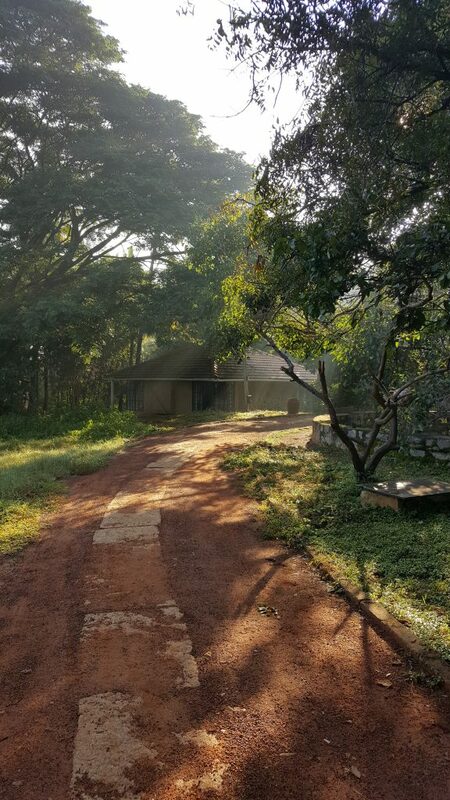 We just came back from Bangalore where we studied for a while at a place called Visthar in the outskirts of the city. While at Visthar, we had a series of lectures about the environment, specifically how to care for the environment and for the people, animals and plants that make it up. Here’s a highlight reel of our time at Visthar, the lectures and experiences that I most enjoyed and took something from. First, one of the lectures that I thought was interesting with a simple but important message was a lecture about soil. Yes, bear with me, it might not be the most exciting thing at first glance but when you really think about it, so much has to come from soil of some sort, literally all of our food to some degree depends on soil for its nutrients whether you are a vegetarian or even if you eat meat. The animals you might eat still depend on grasses, which in turn depend on soil. The lecturer, who goes by Soil Vasu was a passionate and captivating man. He told us about all of the important life forms that live in the soil and whose day to day life processes all culminate together to produce the soil that is necessary to grow and sustain other processes of life. Soil Vasu showed us different types of soil on campus and even showed us how to tell which soil is healthy aka smells sweet, can be compacted and stays together and has signs of life in it like worms. Another cool thing he showed us, though quite stinky, was the making of a soil fertilizer that is eco-friendly called panchagavya roughly translating to 5 cow parts. The recipe involves 5 different ingredients derived from the cow: cow dung, milk, curd, cow urine and ghee as well as bananas, jaggery (brown sugar) and water. Another great lecture that, at first, I was a skeptic of, was a talk by this woman named Charumathi Supraja. She started the lecture by asking us to picture a tree that was important to us at some point in our lives. She went on to ask us to greet and hug the tree. I honestly almost checked out right then and there but, somewhat reluctantly, I decided to humor her and imagined a tree from my daycare days under which my first pet, Scamper the rabbit, was born in a hut. I remember it as a huge tree with a thick trunk surrounded by wood chips or mulch that were probably there to be a softer landing for a small but rambunctious and falling child. The tree didn’t say much and honestly I’m pretty sure I made it say “hi” to me in my own mind to have something to say to this woman. Whatever I felt about the imagining of the tree, I do know that the memory of this tree made me pretty happy and it reminded me of what makes me love animals so much and what makes me care about nature and the world around me in general. I remember my daycare to be really into showing us the different parts of our world in a fun and exciting way. I remember watching caterpillars go through metamorphosis into a butterfly, watching chicks hatch out of an egg that had been incubating in a small cage down the hall, growing cherry tomatoes and not liking the taste very much (still to this day I don’t care too much for cherry tomatoes but I like that they grow for others to eat), having the rabbit cage accessible to all the running children under that huge tree in the playground, and a special reptile day where a row of like 10 kids held a huge python while our parents and relatives watched. All of these memories came back and it finally clicked why I have so much respect (though little to no actual hands on experience, coming from the Miami suburbs) for animals and nature in general. 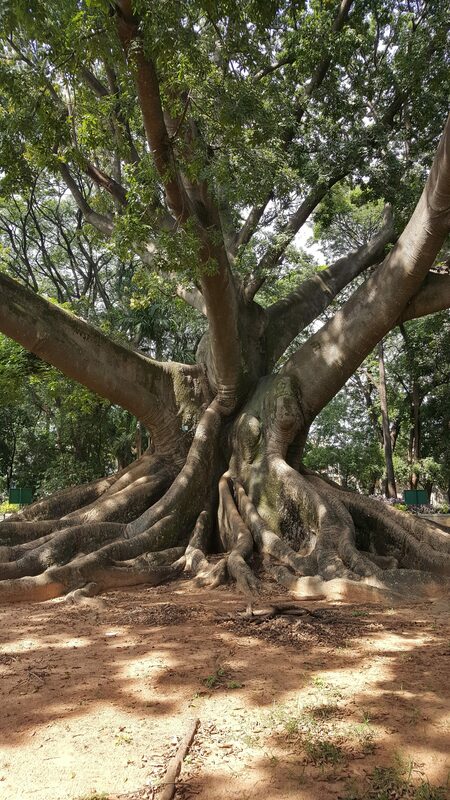 Huge Tree from a park in Bangalore that reminded me of Charumathi Supraja’s talk. Photo by Heather Lowe. Another event we were able to take part in was a panel on ecojustice where Soil Vasu, David (the founder of Visthar), Professor Cindy Johnson and Dr. Paradise talked about their views on environmental justice. I enjoyed this talk as it reinforced, in different ways, what we had been learning for the past couple of days. Dr. Paradise’s talk especially resonated with me because he talked about justice for animals as well as nature in general. He made a connection between people and nature using the humanities, which, I think, was part of a lot of Visthar’s lectures in general. 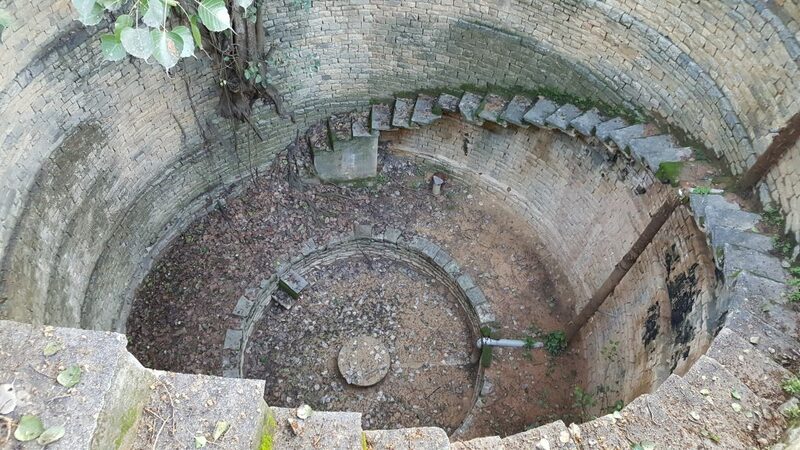 For example, Charumathi’s talk about treevelling (travelling to see trees) connected her passion for trees with how we should care for the earth and for those who the world often shuns aside, especially women, through the medium of poetry. We also saw this connection through the theatre production about the Bhopal incident that happened in India and through a woman named Francoise Bosteels’ doll art. 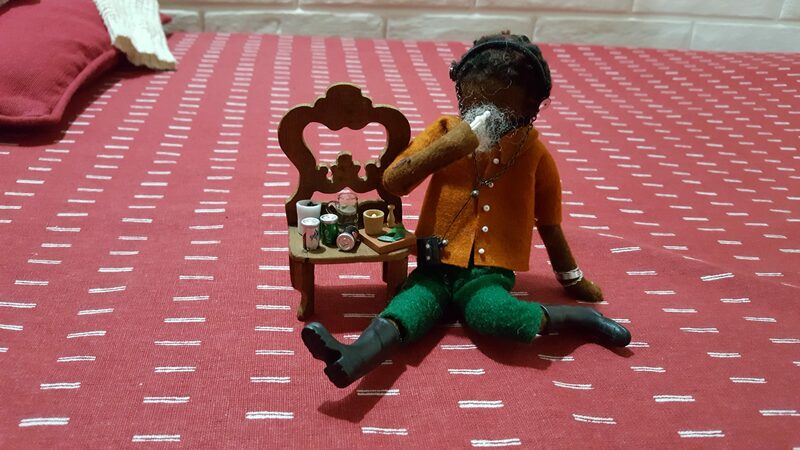 Francoise is a resident artist at Visthar and matches poems (she either creates, finds or comissions from a friend) to dolls and scenes she creates to depict people of everyday India and other places she has been. Doll called “the drug addict” made by Francoise Bosteels. Photo by Heather Lowe. To me, all of these ideas and forms of expression for the injustices in the world, through theatre, poetry, and craft making are a powerful way to make people understand and more importantly understand through their feelings the harm that we have been doing to not only nature and animals but to our own species as well. Often in science and in academia in general, I have noticed that there is a leaning towards thinking about things theoretically in depth and never really making it to the application of the thought to what we see in the world. The theoretical part is indeed necessary, no doubt about that, but to me, its equally important to be able to apply what we learn to the things we see in our world that we think are unjust or doesn’t make sense in order to try and make it better for future generations. That’s why I think the ideas behind Visthar, to connect the humanities with injustices and humanize the problem instead of just making it a theory is an important step to changing the way that people think, or to even get them to think period, about their world. This will hopefully lead to some sort of improvement instead of a continuation of the degradation of the environment and other living beings. One of the last talks we had during our time at Visthar was a talk about Ecofeminism by Mercy Kappen. Eco feminism is a relation of women to nature and that the degradation of nature is in turn linked to the degradation of women. Ecofeminism considers all forms of oppression to be somehow linked and that they should all therefore be fought together. From her talk, I took out that if it is possible to lift up the least of us in this world, the environment, and teach people to relearn how to respect it instead of exploit it, we can also lift up many of the other oppressed groups particularly women. Towards the end of her talk, Mercy told us about the common features of ecofeminism and they reminded me a lot of the Posse Scholarship and the organization’s mission and values, or at least what I’ve felt that Posse is trying to get at. Ecofeminism’s common features, according to Mercy are an ethics of care, power with not power over, progress as dialogue and cooperation, an attempt at finding the big picture or a more holistic understanding and non-dualistic or hierarchical relationships. I liked this concise list of the goals of ecofeminism because it is something that I have been trying to accomplish in my own life and to me it is similar to the purpose of having a Posse, to build each other up in a caring and personal way while also understanding the person as a person full of flaws just like any other. Posse is supposed to produce leaders of future generations but the leaders produced are not overbearing on anyone else, it is more cooperative or synergistic in leadership. We are all supposed to take care of each other, and each person will understand and show that care in a different way which compliments each individual person’s leadership role. Our time at Visthar was unexpectedly good for my self-reflection not only because we were finally face to face with other American students also living in India and were able to compare our experiences to theirs but also because of the way that poetry and the humanities in general made me reflect on how I have lived my life so far and how I want to continue or change how I live. My time in India has especially allowed me to face my privileges and understand them better, something I strive to do every day any time I can but that is often times still hard to face head on. The trick, I’ve found, is to think of your privilege as a means to help others and reflect on yourself to temper your ego rather than to take advantage and flaunt your privilege at the expense of others. To me, ecofeminism as I currently understand it will now be the goal, with occasional changes when and if necessary.